2013년 7월 11일 이후 유럽에 유통되는 모든 화장품에 대해 적용되는 온라인 등록 시스템으로 화장품 원료 및 성분에 대한 관리 및 통제가 이루어집니다. E.U 28개국과 EFTA 4개국에 적용됩니다. CPNP 등록은 유통 전 의무절차로 R.P의 기본의무이며 유럽 안전성 평가사가 작성한 화장품 안전성 보고서를 등록시키는 업무입니다. 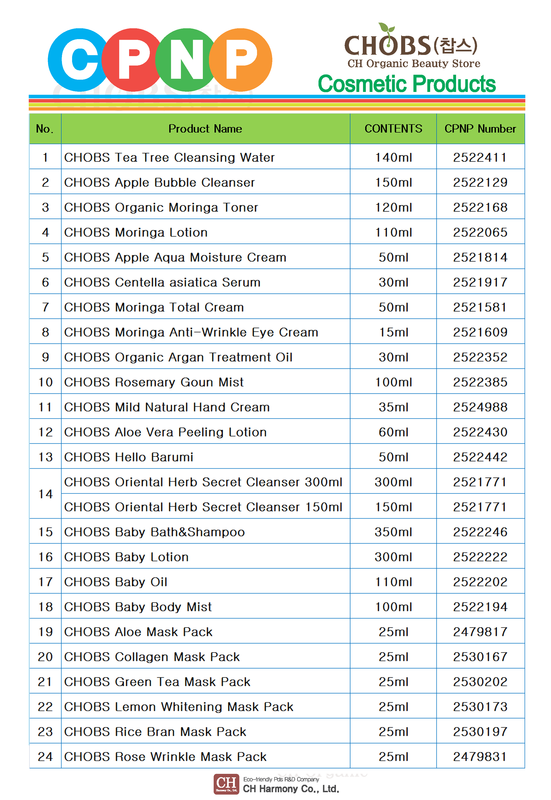 As of July 11, 2013, an online registration system applies to all cosmetic products that are distributed in Europe, providing control and control over cosmetics and ingredients. Applies to 28 countries and EFTA 4 countries. The CPNP registration is a basic duty of the pre-processor and is responsible for registering a cosmetic safety report prepared by the European Safety Evaluation Agency. 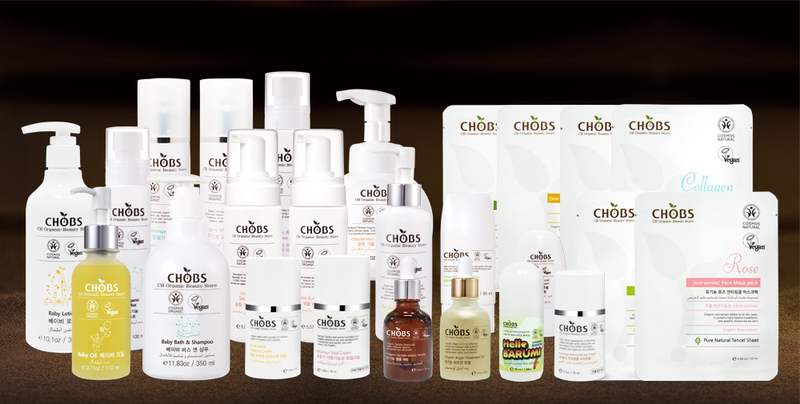 CHOBS 베이비4종(베이비샴푸&바스, 베이비바디미스트, 베이비오일, 베이비로션), CHOBS 유기농 마스크팩 6종(콜라겐,알로에,녹차,쌀겨,로즈,레몬), CHOBS기초라인11종 (티트리클렌징워터, 애플버블클렌져, 알로에베라필링로션, 로즈마리고운미스트, 모링가토너, 모링가로션, 병풀세럼, 아르간 트리트먼트오일, 애플아쿠아크림, 모링가토탈크림, 순한거품 여성청결제(150ml, 300ml), 순한 핸드크림, 헬로바르미)로 총 25품목 이다.